Keeping dogs inside during extreme cold is more than just a precaution — it’s also the law in Pennsylvania. Winter in Pennsylvania means sweater weather — and if it’s cold enough for you to need one, chances are your dog should be wearing one, too. Whether you think they look adorable or ridiculous, dog sweaters can perform an important function, depending on the dog. This is just one of many ways pet owners can protect their animals from the elements during the winter. Keeping dogs inside during extreme cold is more than just a precaution — it’s also the law in Pennsylvania. Passed in 2017, Libre’s Law prohibits owners from leaving dogs outdoors alone for more than 30 minutes when the temperature falls below 32 degrees Fahrenheit. Of course, most dogs will need to go outdoors to relieve themselves at some point during bad winter weather. 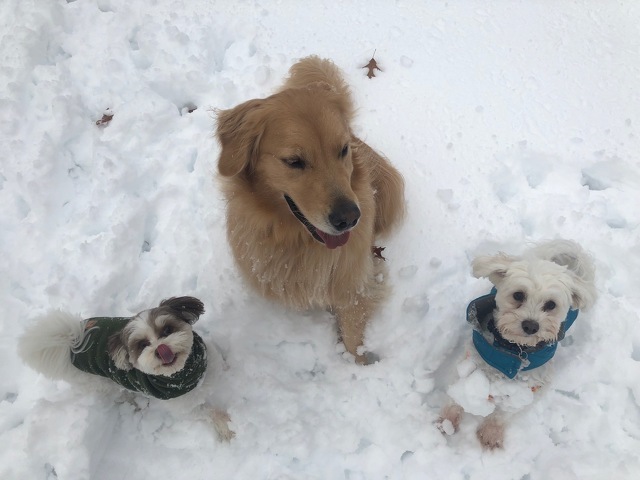 “If there is snow, it’s tough, especially for the little dogs, to be able to find a place to go to the bathroom, so keep an area shoveled, even if it’s just a small square or a little path where they can move around,” said Dr. Jeffery Miller, owner of Halfmoon Valley Animal Hospital. This is important because when dogs can’t find a comfortable place to urinate, they may not fully empty their bladders, which can lead to urinary tract infections, he said. Sometimes dogs like to play outdoors no matter what the weather, so even if they are wearing a sweater, watch for signs that their paws and other extremities are getting too cold. “If they start shaking or holding up their paws and not wanting to use their feet, it’s time to go inside,” Allard said. Even feral cats may need some help from humans during the winter. Miller also recommends using heated water bowls or heated bird baths to ensure that outdoor cats always have a fresh source of thawed water. Outdoor cats sometimes seek out warmth up inside a parked car near the fan belt, Miller said, which can cause serious injury to the cat — and possibly to the car. Antifreeze can pose a danger to cats and dogs alike during the winter. “Antifreeze tastes sweet to them, so sometimes they will try to lick it up off of garage floors or driveways. Even a small amount can be toxic for them, so try to keep spillage to a minimum,” Allard said. Other common issues Allard sees at this time of year include dry, cracked paw pads due to either dry air or to salt from the ground acting as an irritant. She recommends the use of dog booties or a product called Musher’s Secret for dogs who like to hike or hunt with their owners. A lot of people think that when winter comes around ticks are not going to be an issue, but that’s not the case — especially if you get even a day or two of high 30s or 40 degree weather, the ticks get very active,” said Miller.